Centacare Housing Service is a Registered Housing Provider and our mission is to provide long-term affordable community housing options for people on low incomes aged 18 years and over. Our housing stock includes a number of properties we manage on behalf of the Department of Health and Human Services and 39 National Rental Affordability Scheme (NRAS) homes that Centacare own. We provide people in the community with an affordable alternative to public housing and private rental accommodation. A Year of Youth event! This year’s Catholic Mission Church Appeal highlights the important work of Catholic Mission in Myanmar. Take the time to read and reflect on Sunday’s Gospel. Recently released reports from the researchers at the National Church Life Survey reveal some interesting information on Australians views about faith and church life. Catholic Care are currently seeking to fill two ongoing Pastoral Care Practitioner vacancies at Hopkins Correctional Centre Ararat and Langi Kal Kal Prison Beaufort (re-advertised). Presented by Fr Richard Leonard SJ. A Closure Mass will be celebrated in St Augustine's Church, Jeparit. An ecumenical welcome to the Australian Catholic Bishops’ Social Justice Statement on the homeless was held on Tuesday, September 25. 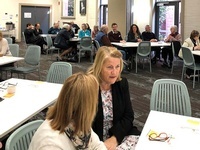 This national conference engaged parishes and faith communities in a conversation focusing on five key areas: Leadership, Culture Change, Young People, Belonging and Evangelisation. Students attended a Social Justice workshop designed to inform and empower youth to name and plan action. Leah Young spent the September school holidays in India. Youth ministers from across Australia and New Zealand came together in Sydney recently to attend the Australian Catholic Youth Ministers Convention (ACYMC). A Commemoration Ceremony was held at Ballarat’s POW Memorial to honour the bravery and courage of these Australians. The Catholic Women’s League General Conference was held in Bendigo this year. October 15 marked the 70th Anniversary of the Sisters of the Good Samaritan leaving Australia to begin their mission in Japan, three Sisters were from Western Victoria. St Patrick’s Primary School, Port Fairy made a difference in their community for National Carers Week.